Nathaniel Hong, a professor at Olympic College in Bremerton, conducted years of research on the occupation of Denmark by Nazi Germany. His book Occupied(2012) is a balanced and engaging account on both the resistance and the adaptation to the Occupation Power. 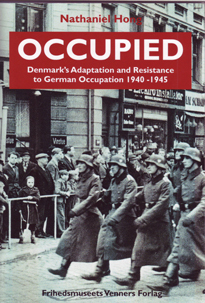 The book does not beautify or condemn but explains the tension between two main political lines and its importance for Danish cultural, economic, and social history during the occupation and post war development. It is highly suited for both the general reader and for the organized study of Danish history. Hong also wrote Sparks of Resistance (1996) and was associate editor of Princeton University Press' final seven volumes of Kierkegaard's Writing series.